Needle ingestion is extremly rare among the ingested foreign bodies. The longer, slender, sharp-ended foreign bodies such as needles, the chances of perforation are considerably greater. 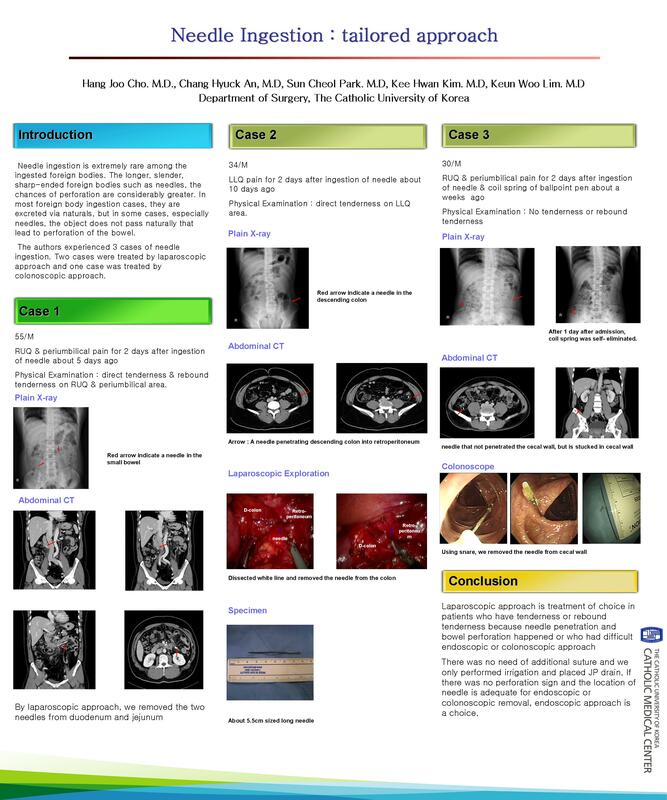 In most, foreign body ingestion cases are excreted per vias naturals, but in some cases, especially needles, the object does not pass naturally, and lead to perforation of the bowel. The authors experienced 3 cases of needle ingestion . two cases were treated by laparoscopic approach and one case was treated by colonoscopic approach. A 34-year-old man who ingested a needle about 10 days ago was refered to our clinic with left lower quadrant(LLQ) pain for 2 days. On Physical examination, the showed tenderness on LLQ area, but no rebound tenderness and muscle guarding. Abdominal plain X-ray and CT scan showed a needle in the descending colon and perforation into retroperitoneum. We performed laparoscopic approach and dissected white line, then removed the needle from descending colon. The regular diet started at POD#4, and patients discharged at POD #6. A 55-year-old man, who ingested two needles about 5 days ago, was refered to our clinic with RUQ and periumbilical pain for 2 days. Plain abdominal X-ray and CT scan showed needles located in 2nd portion of duodenum and proximal jejunum and the penetrated bowel wall. By laparoscopic approach, we removed the two needles from duodenum and jejunum and performed irrigation. A 30- year -old man who ingested a needle and coil spring of ballpoint pen about a week ago, visited clinic with RLQ pain. On physical examination he showed no tenderness or rebound tenderness. Plain abdominal X-ray and CT scan revealed a needle to be located and stucked in cecum and the coil spring portion located in sigmoid colon. There was no penetration finding. The coil spring was eliminated with defecation 1 day after admission. We performed colonoscopy and removed the needle with snare. Laparoscopic approach is treatment of choice that patients who have tenderness or rebound tenderness because needle can penetrate and perforate bowel. It is difficult to perform endoscopic or colonoscopic approach. There was no need of additional suture, and we only performed irrigation and placed JP drain. If there was no perforation sign, the location of needle is adequate for endoscopic or colonoscopic removal, and endoscopic approach is a choice.